Alex, the protagonist of YIIK: A Postmodern RPG, is a burned out liberal arts major who returns home after graduating college just as the year 2000 is looming. The player explores his small town of Frankton, stumbles upon a stray cat in the woods, and is soon plunged into a rabbit hole of creepypasta-inspired mysteries woven around feelings of loneliness and alienation. Unfortunately, after playing for about five hours, I already can’t stand to be around Alex anymore. YIIK, created by Ackk Studios and coming to Switch, PS4, and Steam on January 17, is part visual novel, part adventure game. It’s inspired by the Japanese role-playing games of the 90s, in particular 1994’s Earthbound for the SNES. You find slices of pizza in trash cans that restore health. Alex fights monsters using household objects like vinyl records instead of swords or guns. The game even sports mysterious, inter-dimensional beings who look and behave a whole lot like Starmen. Alex’s quest to find out what they’re all about involves gaining other party members, level grinding, and solving environmental puzzles to progress through the game’s handful of dungeons. At the same time, YIIK tries to be forward looking, borrowing from the twitch-based mini-games for turn-based combat used in Toby Fox’s Undertale (Fox also contributed some of the music in the game). Each character’s weapon of choice—a vinyl record player, keytar, or digital camera—relies on a unique mechanic. The record player, for instance, requires you to put the needle down on specific spots while the table’s turning in order to rack up the highest hit combo. Defending against enemy attacks is similar, requiring you to press a button at the right time to either limit damage or dodge it altogether. There’s one traditional feature from Earthbound that YIIK abandoned but probably shouldn’t have: the silent protagonist. Alex talks. A lot. Not just to other people but to himself. All of his lines are voiced, and while the actor performing them does a fine job, the game’s verbose script left me cringing more often than not. Eventually I just rushed through most of his lines by mashing the A button. It doesn’t help that Alex is a young twenty something who thinks he has interesting ideas about stuff because he took a few courses on philosophy while getting his degree. He always has something to interject, and his internal monologues frequently drag on, peppered with one too many adjectives and adverbs. Blank slates have their virtues in these types of games, especially when paranormal nonsense is lurking around every corner. When a ghost-like girl bleeding from the eyes gets telekinetically dragged out of an elevator by otherworldly beings, you can probably just let that moment hang without further commentary. After five hours with the game, I’m struggling to hold on to the parts of it I like and ignore the growing presence of the ones I don’t. 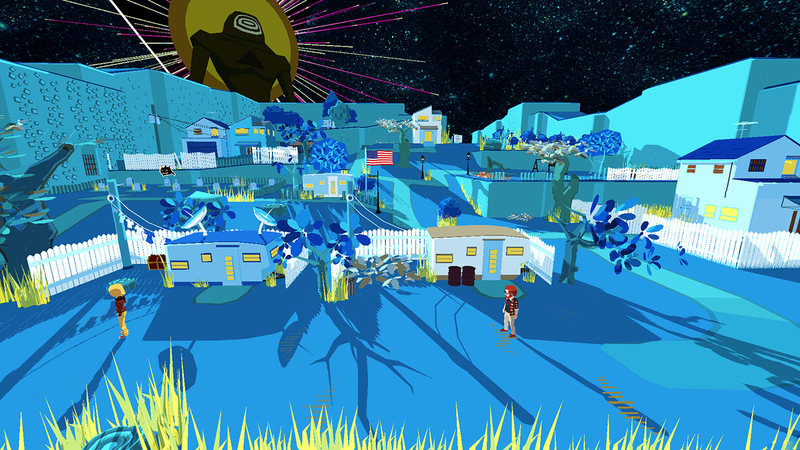 Pacing is crucial to a throwback like YIIK, but that happens to be one of its biggest weaknesses, with no consistent ebb and flow between working through the main quest and having reasons to go off the main path to just get to know the world better. Loading screens are frequent, whether going through a door or into a battle. The interplay between buying new items and increasing characters’ stats through leveling up is slow and somewhat opaque. My characters don’t seem to be doing that much more damage than when I started, and the reward to time spent fighting a battle seems all over the place. At one point I spent close to 10 minutes fighting a trio of rats. It did not seem worth it. There may be a method to some of this clumsiness; the game is called A Postmodern RPG, after all. I wouldn’t be completely surprised if later on in the game the layers of nostalgia and unpolished gameplay get slowly pulled back, revealing an even weirder, less-linear game underneath. Sadly, I’m not sure I have the willpower to hold out for any potential breakthrough. I say sadly because on paper, and in large swaths of the actual game, YIIK should be 100% my jam. Alex’s house, situated in the center of the bright and vibrant Frankton, is a nearly perfect recreation of the home I always wished I’d grown up in. One that had internet before the 2000s. One that was as large and conventional looking as the one the punkish, jackbooted Daria lovingly ridiculed from within in the grunge-era MTV cartoon. One where my bedroom somehow had its own small CRT, PS1, and SNES hooked up and ready to go. These relatable details, lovingly spackled across the game, successfully pulled me in, but they aren’t enough to carry the rest of what I’ve played so far. I really want to love YIIK: A Postmodern RPG, and at times I do. When its bright colors, eerie music, and nostalgia for early internet message boards and the weird conspiracies they spawned comes together, the game feels exciting to explore and filled with weird possibilities. In between these moments, however, YIIK is hampered by a lack of polish, poor pacing, and overwrought narration.